A ruler, sometimes called a rule or line gauge, is an instrument used in geometry, technical drawing, printing and engineering/building to measure distances and/or to rule straight lines. Strictly speaking, the ruler is essentially a straightedge used to rule lines, but typically the ruler also contains calibrated lines to measure distances. Rulers have long been made of wood in a wide range of sizes. They are not however all wood. Plastics have been used since they were invented; they can be molded with length markings instead of being scribed. Metal is used for more durable rulers for use in the workshop; sometimes a metal edge is embedded into a wooden desk ruler to preserve the edge when used for straight-line cutting. 12 inches or 30 cm in length is useful for a ruler to be kept on a desk to help in drawing. Shorter rulers are convenient for keeping in a pocket. Longer rulers, e.g., 18 inches (45 cm) are necessary in some cases. Rigid wooden or plastic yardsticks, 1 yard long and meter sticks, 1 meter long, are also used. Classically, long measuring rods were used for larger projects, now superseded by tape measure or laser rangefinders. Desk rulers are used for three main purposes: to measure, to aid in drawing straight lines and as a straight guide for cutting and scoring with a blade. Practical rulers have distance markings along their edges. A type of ruler used in the printing industry is called a line gauge. These may be made from a variety of materials, typically metal or clear plastic. Units of measurement on a basic line gauge usually include inches, agate, picas, and points. More detailed line gauges may contain sample widths of lines, samples of common type in several point sizes, etc. Measuring instruments similar in function to rulers are made portable by folding (carpenter’s folding rule) or retracting into a coil (metal tape measure) when not in use. When extended for use they are straight, like a ruler. The illustrations on this page show a 2-meter carpenter’s rule which folds down to a length of 24 cm to easily fit in a pocket, and a 5-meter-long tape which retracts into a small housing. A flexible length measuring instrument which is not necessarily straight in use is the tailor’s fabric tape measure, a length of tape calibrated in inches and centimeters. It is used to measure around a solid body, e.g., a person’s waist measurement, as well as linear measurement, e.g., inside leg. It is rolled up when not in use, taking up little space. A contraction rule is made having larger divisions than standard measures to allow for shrinkage of a metal casting. They may also be known as a ‘shrinkage or shrink rule. In geometry, a ruler without any marks on it (a straightedge) may be used only for drawing straight lines between points, not measuring. A straightedge is also used to help draw accurate graphs in algebra and other math subjects. A ruler and compass construction refers to constructions using an unmarked ruler and a compass. It is possible to bisect an angle into two equal parts with ruler and compass. It can be proved, though, that it is impossible to divide an angle into three equal parts using only a compass and straightedge â€” the problem of angle trisection. However, should two marks be allowed on the ruler, the problem becomes solvable. 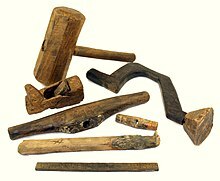 A wooden carpenter’s rule and other tools found on board the 16th century carrack Mary Rose. Rulers made of Ivory were in use by the Indus Valley Civilization period prior to 1500 BC. Excavations at Lothal (2400 BC) have yielded one such ruler calibrated to about 1â„16 in (1.6 mm). Ian Whitelaw holds that the Mohenjo-Daro ruler is divided into units corresponding to 1.32 in (33.5 mm) and these are marked out in decimal subdivisions with amazing accuracy, to within 0.005 in (0.13 mm). Ancient bricks found throughout the region have dimensions that correspond to these units. Anton Ullrich invented the folding ruler in 1851. ^ a b Whitelaw, p. 14. Look up ruler in Wiktionary, the free dictionary.